however, this is slowly changing with the introduction of microchips for foals born in Australia post 1-September 2017. Horses cleared in from other countries to race or breed will also need to be microchipped before they are registered for such activities. Australian Standardbreds are branded with two rows consisting of four symbols in each row. 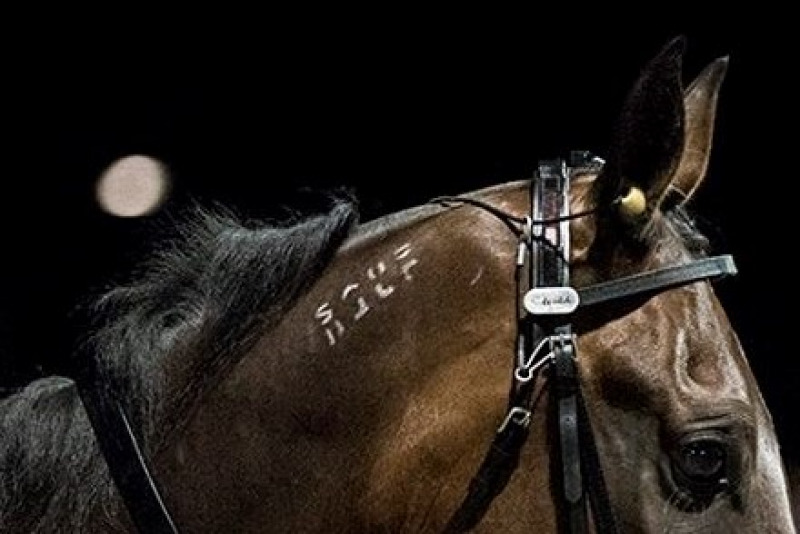 The first line includes the S denoting the horse as a Standardbred, followed by the code for the state in which the horse was born and then the last two digits of its year of birth. The second line denotes its 4 digit registration number. As from 1/8/87 all freeze brands had an extra symbol added to denote the foal is a Standardbred and the last two digits of the year of foaling were also included, horses that were born prior to this date will have a single line brand with an underscore instead of two lines. The brands are usually found on the off side of the horse's neck and for the foreseeable future will work in tandem with microchips. Microchips offer a unique and unalterable means of identification for horses. These passive transponders are implanted in the nuchal ligament on the near side (left side) of the neck and remain inactive except when scanned. The transponder's circuitry is then energised by a low-power radio signal sent by a compatible scanner. The transponder then sends a unique 15-digit code back to the scanner where it is displayed. No two microchips are the same, having been pre-assigned and coded during the manufacturing process in accord with ISO and ICAR protocols. Microchips are the size of a grain of rice and have their electronics assembly hermetically sealed in biocompatible glass with a biostable coating. The coating acts as a tissue interface - so once implanted the horse's cells readily proliferate on the coated microchip. If you find a lost horse that you can identify as a Standardbred from either a freezebrand or microchip, please contact the relevant State Controlling Body. Whilst both microchips and freezebranding are unique identifiers, all registered Standardbreds are also identified via DNA genotyping utilising hair samples to provide parental verification. These hair samples are collected at the sametime as the microchipping implanting and freezebranding before being forwarded to Maxxam Analytics Inc (Canada) for testing. These identifiers play an important role underpinning the integrity and rigour of the registration processes, Studbook and racing performance.